Hash House A Go Go is a famous restaurant landmark in San Diego. Specializing in breakfast and brunch, Hash House has won several awards for “Best Breakfast in San Diego”, and it won the “Best Breakfast of 2011” in the San Diego Union Tribune. You can easily see how great this place is by the huge line always outside of the place. Everytime I was in San Diego and used to call to see how long the wait was, there was always at least an hour to two hour wait. I have been to San Diego many times, and because there is always a long wait at Hash House, I usually ate brunch at The Broken Yolk, which is another fabulous breakfast/brunch spot in SD. But this time, my girlfriends and I got VIP treatment and got to skip the line and walk right in, thanks to our amazing concierge at the US Grant Hotel in downtown San Diego, and it didn’t hurt that he said I was a food blogger which was the truth obviously lol. ALL THE PEOPLE WAITING IN FRONT OF HASH HOUSE. THIS IS NOT BAD COMPARED TO HOW IT USUALLY IS. Ok, enough talk, it’s time to show you the food. The food comes out on PLATTERS, not plates- portion sizes to feed giants. It’s absurd how big the portions are. But the demonstration of the food is creative and impressive, and everything is absolutely delicious. Two Eggs w/ bacon, sausage or potatoes, and comes with their signature flapjakes. You can substitue flapjacks for a waffle or french toast for $1 more. I substituted it w/ their famous Griddled French Toast which is their signature Amish style bread dipped in a banana cinnamon cream with pecan maple syrup. The french toast was amazing! The perfect sweet. The bananas were carmelized and drizzled w/ powdered sugar. With eggs and bacon you get the perfect combination of sweet and salty- the best of both worlds. The Griddled French Toast was recommended by our server, and I highly recommend. Unbelievable! I mean…..what more can I say about this. The decription and picture pretty much sums it up. Another Hash House favorite dish. I saw many people order this particular eggs benedict, this was another dish recommended by our server, and I can see why! It’s such a fun combination, and who doesn’t like fried chicken, a fresh baked biscuit, served on a bed of mashed potatoes…with bacon and cheese and chipotle sauce lol. Pretty intense, but all the ingredients just work together. A little too rich and heavy for my first meal of the day, but my friend loved it! Btw, check out how enourmous the platter is! My friend sitting next to me ordered this and said it was one of the best breakfasts’ she’s ever had, she said. I kept stealing bites off her plate, it was so good! I was obsessed w/ the red pepper cream sauce. It tasted like a hearty tomato/red pepper soup bisque. She ordered a side of chipotle cream sauce as well. She mixed everything together with all the sauces and it was messy, flavorful and delicious. The biscuit was freshly baked. I ate half of it, so good. Such a fun eggs benedict, nothing like I’ve ever seen before! Um, this is ridiculous lol. It was literally served in a pot. This picture doesn’t even do justice because it was so huge in real life. Again, another rich and heavy dish, especially with all the gravy on top. But this is EPIC! Love the presentations at this place and of course it was amazing. Who doesn’t like pot pie crust? Flaky, warm and crispy. Delicious. MY FRIEND CREATED THIS SCRAMBLE WITH AGED CHEDDAR CHEESE, SPINACH, & MUSHROOMS. CAN’T GO WRONG, IT’S A CLASSIC! If these pictures are not convincing enough, well than you are just going to have to go for yourself! Lol. Hash House A Go Go is a MUST if you are in San Diego. It’s the perfect breakfast/brunch spot. Portion sizes are ridiculous, the presentation of the food is very colorful and creative, and most importantly, the food is delicious. Hash House makes breakfast fun. 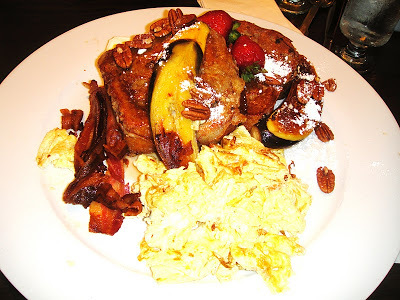 There are also Hash House locations in Las Vegas too!